Catalina Maria Johnson » LAMC Preview! http://beatlatino.s3.amazonaws.com/Latin%20Alternative%20Music%20Conference%202018%20Preview_Beat%20Latino%20with%20Catalina%20Maria%20Johnson%20%282%29.mp3 Download this Episode of Beat Latino (MP3) It’s that time of year when the Latin Alt tribe reunites in New York City to celebrate the newest and latest and most cutting edge sounds and grooves in the IberoAmerican-Latin-Latinx-Hispanic world! Here’s a preview of some of the sounds we will be checking all over NYC! 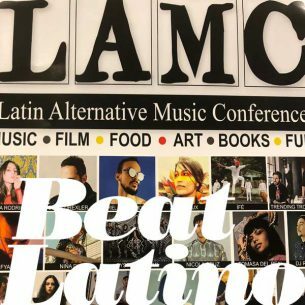 Join us at the LAMC on this week’s Beat Latino!